Gridwall waterfall 7-tube faceout, rectangular tube, upscale rectangular tube. Great display for multiple hangers with clothes. Multi-use makes this faceout most popular display. 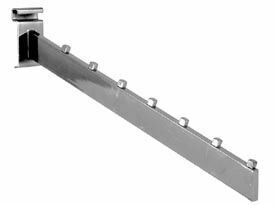 Dimensions: Slant arm - 15.5"long; protrudes from the back 14"long horizontally; thickness of tube 1.5"H x 0.5" thick; backplate - 2"wide x 3.5"H. Colors: black, white, chrome.